The Zebra Crossing was first introduced in limited numbers on UK public roads in 1949. The original Zebra Crossing had alternating blue and white stripes. Although Zebra Crossings are gradually being phased out by more sophisticated pedestrian crossings such as the Puffin Crossing, they are still a common sight on UK roads. When driving examiners design the driving test routes, they intentionally incorporate as many various types of pedestrian crossings as possible, especially the Zebra Crossing. This guide explains the rules and regulations used at Zebra Crossings for both the pedestrian and for drivers approaching and stopping at Zebra Crossings. In particular, this tutorial explains the correct procedures that car drivers (and those on a driving test) should adhere to when approaching a Zebra Crossing. It’s important to always look well ahead whilst driving, not only during your driving test, but also once you have passed. Zebra Crossings do fail a large amount of driving tests, not necessarily due to the actions of the learner driver, but pedestrians. Pedestrians and cyclists often can enter onto a Zebra Crossings with little regard for traffic. Although this may seem like the fault of the pedestrian or cyclist, the examiner will always look upon the learner driver to take the appropriate action in avoiding a potential accident. Cyclists also pose a problem at Zebra Crossings. Although regulations inform cyclists to dismount whilst crossing a Zebra, some often young riders, often don’t which results in a cyclist approaching a crossing too fast for drivers to react safely. Whilst looking well ahead whilst driving, look for road signs situated before a pedestrian crossing indicating a crossing ahead. 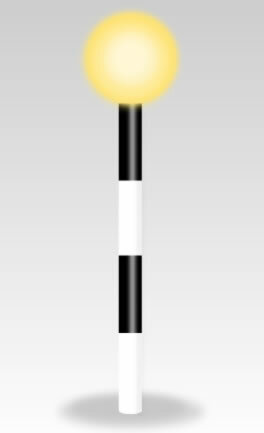 You may also notice the flashing lights further ahead down the road situated on the Zebra called Belisha beacons (see diagram below). The black and white post along with the amber flashing beacon provides drivers with a noticeable visual hazard warning. The earliest opportunity you have to notice a Zebra Crossing up ahead will provide you with the best chance of dealing with it safely and correctly as this will enable you with more time to spot approaching pedestrians or cyclists. On the approach, scan up and down the crossing constantly for any approaching pedestrians or cyclists. Ensure on the approach to look into your rear view mirror to establish if any vehicles are behind you and if so, how close. If a vehicle is close behind you, ease off the accelerator a little earlier just in case you need to stop at the crossing. The examiner will be assessing the speed at which you approach a Zebra Crossing and the appropriate observations. The examiner will be expecting you to look into your rear view mirror and also to be checking up and down the crossing for pedestrians that may wish to cross. The speed at which you approach the crossing and cross it depends on if it is ‘open’ or ‘closed’. If it is open and you can clearly see there are no pedestrians waiting or approaching, there will be no need to slow your car down. If it is closed and difficult to see pedestrians, you will need to slow down to an appropriate speed so as you can safely stop if necessary. An example of ‘closed’ may be vehicles stopped on the opposite carriageway due to congestion that will likely obscure your view of the entire crossing. Legally speaking, you do not have to stop your car unless a pedestrian has placed a foot onto the crossing, however if there are pedestrians waiting, stop your vehicle just before the broken white line to give way. If on a driving test, failure to give way and stop to a waiting pedestrian will result in a failure. If the road is busy and there are traffic queues on the opposite side of the road, it may be very difficult to see a pedestrian. In such a case, you will need to slow down significantly to maintain safe observation and stop if necessary. Try to avoid stopping on or over the give way line at a Zebra Crossing (see give way line on diagram above). If on a driving test, this action is likely to fail you. Stopping on the Zebra Crossing itself is an traffic offence and will certainly fail a driving test. If there is traffic congestion on your side of the road, ensure the vehicle in front has cleared the crossing leaving sufficient room for you to progress over the crossing, and clearing the give way lines on the opposite side. A staggered Zebra Crossing as illustrated in the diagram to the right is often used on busy roads where pedestrians can use a central reservation as a waiting area before crossing the second half of the road. A staggered and a non-staggered crossing with a central reservation is classed as two crossings. With these types of Zebra Crossings, providing there are no pedestrians waiting to cross on your side of the road, you are permitted to continue regardless of pedestrians crossing the opposite side of the road. Stopping for pedestrians who are crossing the opposite side of the road will fail a driving test. Only stop if a pedestrian is approaching your side of the crossing or if they are already waiting. Failing to stop and give way at a Zebra Crossing is a traffic violation and could lead to penalty points on your licence (provisional included) and a fine. In certain accident prone areas, cameras are installed at Zebra Crossings to catch offenders. Arm signals are not used often these days although it once used to be a significant part of the UK practical driving test many years ago. Arm signals can be used as an extra safety measure to alert other vehicles of an impending hazard. A driver must stop and give way to a pedestrian approaching a Zebra Crossing with the intention of crossing or for waiting pedestrians. The zig zag lines painted on the road either side of a Zebra Crossing are areas where vehicles are not permitted to park. Parking in these areas obstructs the view of the crossing to other drivers and increases the chances of accidents to both drivers and pedestrians. The Zebra Crossing area must be kept clear at all times to allow the safe passage of pedestrians. Stopping in this area is hazardous for pedestrians and will certainly fail a driving test. A driver is not permitted to overtake another vehicle on a Zebras Crossing. Overtaking a cyclist is permitted. Gesturing pedestrians at a Zebra Crossing to cross should be avoided. A pedestrian may take this action as meaning it is safe to cross and is a common cause of accidents. Always keeps a sharp eye out for road signs. 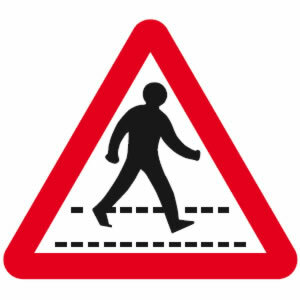 Zebra Crossing road signs may be in place to warn you of a pedestrian crossing ahead. They provide advance warning of the hazard ahead, giving you time to prepare. 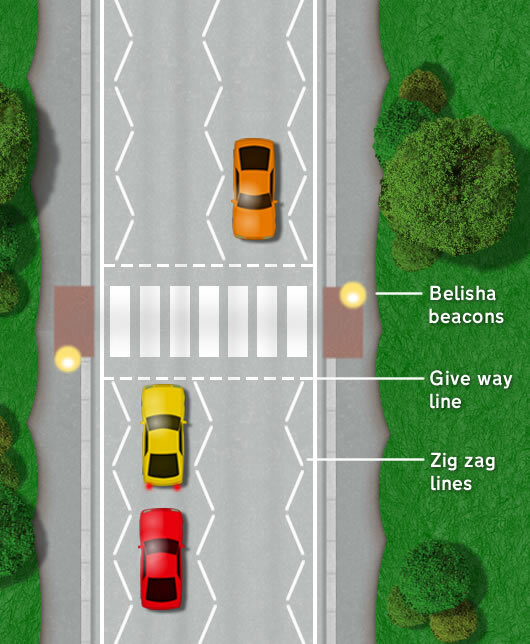 Belisha beacons are placed either side of a Zebra Crossing to aid approaching drivers of a potential hazard. Belisha beacons flash on and off each at a cycle of around 1 second. Unless you are forced to stop your vehicle due to traffic congestion or giving way to a pedestrian crossing, it is a prohibition to stop or park your vehicle on the white zig zag road markings. Doing so will result in penalty points being placed on the drivers licence and a fine. See zigzag road markings for further information on parking procedures and penalties on yellow or white zigzag road markings. i am confused as we are always taught to give way and common sense comes to mind whilst at a zebra crossing but i was informed on a NDORS course by an ex policeman that it is not breaking the law unless a pedestrian has their feet on a crossing. I suppose as many may change their mind or go back to a shop if it is desired but surely if somebody is waiting by a crossing it is different. Yes, you are in fact correct as ‘Legally speaking, you do not have to stop your car unless a pedestrian has placed a foot onto the crossing’ as detailed above. Most drivers do of course stop once they see a pedestrian waiting, hence little need for this old law to be updated. If you were on a driving test and did abide by this old law – driving through whilst pedestrians waited, you’d most certainly fail. Once the pedestrian has started cross the road, must the crossing be completely clear before the motorist proceeds, or can you drive on when the pedestrian has past you and the crossing in front of you is clear? You must wait until the pedestrian has completely cleared the crossing before proceeding. Unless it is a staggered crossing where this is classed as two separate crossings. I had a disagreement with my other half about this the other day – I waited until the pedestrian had completely cleared the zebra crossing. He said I should have moved off as soon as it was clear to do so (though the pedestrian was still on the crossing). I’d like to show him the highway code section to confirm I’m correct – have you got the reference please? 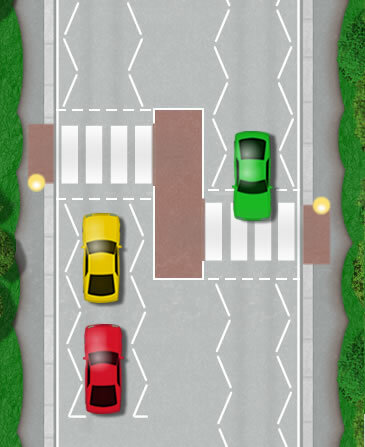 Why are there 3 white zig zag lines before a crossing? as although it is a NIP offence to wait or park on a zig zag line,you would not exactly park in the middle of the road! It’s not about blocking traffic flow. It’s an offence to park there because it obscures the view of the road for the pedestrians and obscures the view of the crossing for road users. I’m sure in the distant past I was told that if a car was within the zigzag zone it wasn’t to be expected by the pedestrian that they could cross, but if a car was approaching then the car had to stop tolow them to cross. It really comes down to the distance the car is from the crossing area and the speed at which the vehicle is moving. If the driver can stop safely when taking into consideration other road users, then they should do so. There are some old rules surrounding Zebra crossings such as the pedestrian’s foot being placed on the crossing before traffic has to stop, but these rules are no longer followed by the DVSA.